Check your emails! 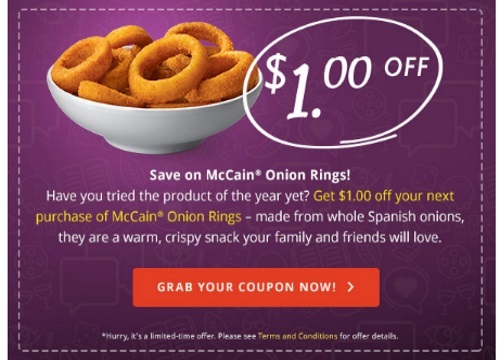 Mccain sent out a newsletter earlier today that has a coupon for $1 off Mccain Onion Rings. The coupon is a mailed one that you can sign up for via the link in the email. This is a private link that is just for their subscribers and cannot be shared. This is a limited time offer, while quantities last. If you aren't a member yet, you can sign up at the link below so that you are notified of the next available coupon offer. Click here to sign up for Mccain newsletter list.